There are two types of people: people who like using lists, and people who think lists are useless. I am a person who loves lists. I love everything about lists: making lists, checking things off my list, and telling people that if you want to plan your life better you need a list. I 100% believe that lists could save you 80% of your time when done and utilized correctly. Now, I’m not a list guru, (I give that title to my sister who, without lists, could have lost her mind by now), but I can still give you some pointers on how I use this wonderful tool. Before I do so, let me give you one exercise you can do which would shine the light on your time management skills. I once attended a time planning training where the instructor told us that to be able to see where your time is wasted you need to make a schedule of what you are doing for a week. So basically, you would write down 7:00 – 7:15 a.m. wake up, 7:15 – 8:00 a.m. shower, dress, and get ready, 8:00 – 8:15 a.m. have breakfast and check the news (I wish!! ), 8:15 -8:50 a.m. commute to work, and so on. Of course, we shouldn’t forget to include all those little things that waste our times such as (play candy crush) and (chat on Whatsapp) or (stalk ex-boyfriend on Facebook heeheheh). So I thought to myself, what an amazing idea! I’ll just do that and eliminate all my wasted time. After a few days, I started seeing a pattern in my schedule: I waste a lot of time using the phone and not enough time doing anything I love and find significant. I chose to change my routine and make conscious decision. So now, when I catch myself doing something wasteful I tell myself make conscious decisions. I also tell myself Are you really hungry, or are you just bored? But I’ll get to that story another time. 1- Start by identifying your biggest time wasters and make a conscious decision about changing them. This would give you a good chunk of time for work. Schedule in your coffee and lunch breaks and give yourself time to breathe. When you have that done, look at the number of hours you can work in awe. This is your canvas. 2- Take a piece of paper (yes I am old fashioned) and write TO DO as a title. Underline it twice to show yourself that this is a very important document. Now leave a few lines (basically press enter twice) and write number one. You can put a dash or a dot, your choice. Great, you’ve got it so far. 3- Write down the things you need to do everyday at work. So if you have to print a specific report, check the cash invoices, file yesterday’s papers, or make specific calls, write those down. This is your first category: your daily tasks. These will not change, they are a crucial part of your job description. 4-Next, write down the things you need to do today. 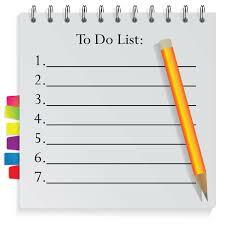 I prefer to have a To Do list done in advance but if you feel like you are living in chaos at work, start with a list. Write the things that need to be done. A weekly to do list gives you plenty of time to shuffle the tasks around. 5- At the end of each task, draw a small box that you can check. Checking the box feels SO good, trust me. Keep the box. 6- Start working according to your list. Start with your daily tasks and go on. How you choose which task to start is your decision. Some people say you shouldn’t check your email before noon (or whatever golden hour they seem to have researched) but come on! You can check your email without replying, right? It’s not like you have the tendency to lose yourself in emails. 7- Review your list. You can make a daily list or you can have a general list (for people like me who don’t seem to get much done everyday). For people with projects that take longer, instead of writing (Finalize the report) you can instead write (work on report due on…..) and check the box when you work on it. The way I review my list is rewrite the things I didn’t complete and totally scratch off things that are done. This feels better than the little tick. So why are lists important? Well, lists display what you need to do that day. They keep you focused on your goal when you feel like life is chaotic. With lists, you make sure that you don’t forget to do that thing you keep forgetting. So you will catch yourself less often wondering (what did my boss ask me to do on Monday?) Lists also service as a cute little motivational pat on the back. The little ticks show you that you’ve done something. During those days when you can’t make yourself work and you feel like you’d rather be home in bed, lists offer you some items that CAN be done with minimum effort. You can choose your tasks and still feel like you’ve achieved something. Finally, lists are fun to have especially if you categorize them based on your workload. If you have your list numbered well and you have a bunch of papers you need to go through, your list can be the (cover) of your file with each page numbered. So item #1 on your list will be the first set of papers, item #2 the second set, and so forth. This HELPS with people who have a lot of paperwork. In the end, lists help save your time. Make conscious decisions, write up a list, and eat because you’re hungry, not bored. Oh, I’ll get to that another time. Till then, happy listings.